Some of the best art comes from difficult circumstances. And few circumstances are as difficult (to put it lightly) as Kesha's legal battle with former producer and alleged abuser Dr Luke. Now free from her previous contract and finally able to release new music, Kesha has done just that. 'Rainbow' is an occasionally brilliant release that's also bloated and inconsistent. Indeed "release" is the right word: indicative of how cathartic this third album is. 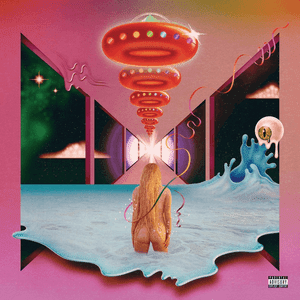 Kesha wrings out every ounce of anger, pain, suffering, relief and fierce empowerment, and pours it into the lyrics of 'Rainbow'. It's an album that thrives on the idea of overcoming adversity to an almost fetishistic degree. Or at the least, it's about finding peace in moving on. "Do your worst, 'cause nothing's gonna stop me now," she claims on Let 'Em Talk, while explicitly on Learn To Let Go she notes "life ain't always fair, but hell is living in resentment" before planning to "exorcise the demons inside me". And you can't blame her for that. Despite all the insinuations towards Dr Luke and the legal case that brim from every track - too numerous to mention directly - 'Rainbow' is ultimately an album of positivity. As the title suggests, peace comes after the storm. There are carefree moments that show Kesha letting her hair down and just enjoying making music: the thrashing, almost teenage glee of Let 'Em Talk, or the moment she giggles in the second verse of the stomping feminist anthem Woman at the silliness of her own lyrics. In these moments, Kesha is a joy to listen to. Yet she's at her most captivating on the album's standout track, Praying. Clearly directed at Dr Luke, it's a plaintive ballad that gradually builds and soars to a euphoric epiphany at the realisation of her freedom, that high note in the bridge symbolic of her pain literally escaping her body. Vocally too Kesha has never sounded better than on this song, as if leaching power from her suffering. The problem with 'Rainbow' is that Kesha occasionally tips too far into preaching territory. On Hymn for instance she positions herself as a martyr singing a "hymn for the hymnless" that feels too overblown - one of many examples of a lack of subtlety to the writing throughout the album. In attempting to make her suffering universal, the album too often feels like an episode of Glee in its trite "togetherness". Musically 'Rainbow' feels chaotic, lurching from gentle ballads to punk rock and synth pop. It's all underpinned with a country sensibility that's at best tongue in cheek (the cowboy parody Hunt You Down) and at worst irritating (the faux-cutesy Godzilla). There are more hits than misses though. Both mentally and musically, 'Rainbow' is certainly wiping the slate clean for Kesha. It marks an exciting and long-awaited return of one of pop's most brilliant stars, but what's more exciting is what's to come next. Listen: 'Rainbow' is out now.